The new ST features Ford’s new 200bhp 1.5-litre petrol engine, said to be the first to offer cylinder shut-off at low loads. It returns 47.1mpg on the combined cycle, emits 136g/km CO2, and is offered in three trim levels. Priced from £18,995, the ST-1 includes Recaro seats, sports suspension, Android Auto and Apple CarPlay connectivity and selectable driving modes. Opt up to ST-2 (from £19,995), and it gains climate control and B&O audio with a larger touchscreen, while ST-3 (£21,495) gets larger 18-inch wheels, satellite navigation and a broader driver assistance pack. Ford is offering an £850 Performance Pack, which adds a limited-slip differential, launch control and performance shift lights, and five-door versions will be available in the UK for the first time. 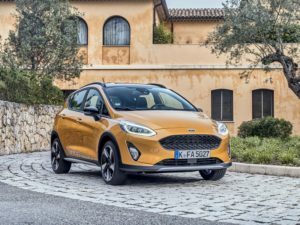 The Active is a new addition with this generation of Fiesta, again offered with three trim levels but only with five doors. Active 1 is priced from £17,995, rising to £19,195 for the Active B&O Play and £20,295 for the Active X. All feature a specific traction control mode for slippery surfaces, as well as SUV-like styling and raised suspension.